Scrapping a vehicle is a complex process that needs to be undertaken by authorised centres who follow strict regulations set out by the Environment Agency. 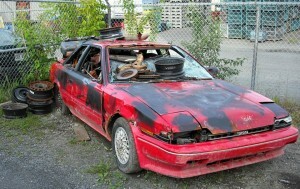 Once you sell your car for scrap, it will be sent to be recycled. Recycling scrap vehicles dramatically cuts down on wastage and pollution. It also prevents the dispersal of hazardous materials and fluids from contaminating the environment. If you scrap your vehicle ensure it’s through a registered yard that’s authorised and approved by applicable environment agencies and connected to an authorised treatment facility ( ATF). New methods are highly efficient and ensure that 80% of your vehicle is recycled, giving you the peace of mind that you’re doing the right thing for the environment. Here’s a look at the recycling process. The battery is removed and taken away to be reused or recycled. The air bags are deployed safely without risk of exploding. The tyres are removed and inspected. If they are too worn to be reused, they will be crumbled down and mixed with asphalt to create road surfaces. Recycling tyres is compulsory as it’s illegal to throw them away on landfill sites. The depollution process can now take place: Hazardous fluids are pumped out using a depollution rig, then sealed into secure tanks where they can be recycled or disposed of by specialist treatment facilities. The vehicle can now be dismantled and recyclable parts such as plastic bumpers and dashboards and glass windscreens and headlights, removed and recycled. The vehicle will then be shredded into small parts. As it passes through the shredding machine, wind turbines and magnets are used to separate the different types of materials to be recycled. The shredding process is incredibly powerful and quick. A vehicle can be shredded in as little as 45 seconds. Scrap Car Kings is connected to a fully certified ATF and is fully compliant with all regulations set out by the Environment Agency. For more information on our scrap vehicles service, contact us today or visit us online.